Tom and Jean Hull were married on Dec. 22, 1962. They will celebrate 52 years with their children Gary Ray and Gwendolyn Elaine, grandchildren Megan and Jacob Kallner and great-granddaughter Madison Renee. Cards are welcome. 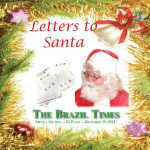 Browse more than 100 letters to Santa Claus in Friday's special section inside The Brazil Times.